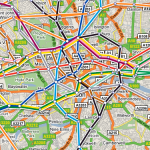 The other day Google added another cool and useful feature to their Google Maps: they've added a "transit" (trains only at the mo) layer for several cities, including London, Cape Town and Jo'burg - yes, I was surprised about the last two too. Whilst the Cape Town and Jo'burg maps aren't likely to be of much use to most people, the London map will certainly be an eye opener for all those people who didn't realise the TfL map doesn't represent the actual layout of the stations, and in fact you could find it's considerably quicker (and cheaper) to walk between two stations than try catch the tube. Next time you're in London, make sure you've got a print out from Google Maps, or even better make sure you have a bookmark already setup on the browser of your phone, and save yourself a ton of time and little bit of cash too.